Aram Khachaturian (1903-1978) claimed that Haro Stepanian was the greatest Soviet Armenian composer. 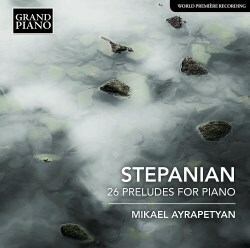 Stepanian was born in the dying embers of the nineteenth century but the piano music heard here consists of works written in the composer's last twenty years. His other works include five operas, three symphonies, songs and chamber music. These twenty-six preludes were written across almost two decades, starting in 1947. The last examples - perhaps part of an intended fourth set - were completed within two years before the composer's death. These are accommodated across a disc approaching 55 minutes duration. Inevitably they are miniatures. As to their style they are examples of high romance mediated with songful shape and carillon motion. In their knightly valour and heroic headlining Rachmaninov is certainly a presence with the Russian émigré's own Preludes never far away. It's Rachmaninov - more than Chopin - but Bach is also there in the weave. In the fourth Prelude of Op. 48 Medtner puts in an appearance. The guileless folk-nationalist flavour is a charming, unsophisticated yet strong aspect in the style: distantly shimmering horizons and wafting evening fragrances. Many of the melodies used - as in the penultimate Prelude of Op. 48 - have an entwining oriental twist. This element will appeal if you are already captivated by those two Guild Rumanian collections by Kirsten Johnson: Këngë and Rapsodi. Stepanian's romantic-folksy style changes hardly at all across these preludes. Rumania is not Armenia but there is a subtle kinship in this case. The excellent booklet is in English and German. The essay by Katy Hamilton is based on notes by the skilled pianist Mikael Ayrapetyan. The Grand Piano engineers conspire with happy results in rendering Ayrapetyan's admirable way with chiming charms and epic rhetoric. So far Stepanian's orchestral music is not to be found in the catalogue but his cello sonata can be heard on a CD reviewed here. Khachaturian was born six years after and died twelve years after Stepanian. Many know of the virtues of Khachaturian who has been multiply recorded. Grand Piano now give us the delights of Stepanian to set alongside the piano music of Arutiunian, Abramian, Komitas, Bagdasarian and Babajanian.